Due to the Audit Commission Report Number 66 of April this year, ImmD have changed one critical aspect of their processes in relation to employment visas. ImmD has updated the sponsorship form ID990B with a page 5 which requires the employing company’s declaration speaking to local recruitment efforts. The page 5 Declaration is not required for all IANG applications. If no local recruitment efforts have been made, you will need to provide a written explanation as to why not. 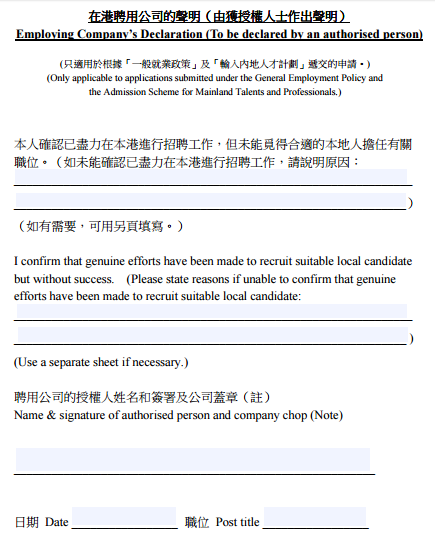 If I Didn’t Graduate From a University Will It Preclude Me From Getting an Employment Visa in Hong Kong? Can I Come to Hong Kong as a Visitor, Find a Job, then Change to an Employment Visa? Hong Kong Employment Visa Application – When All Else Failed We Appealed to the Chief Executive – and Won!